Jammu, Mar 21: An Army Jawan attained martyrdom in Pakistani firing along the Line of Control in Sunderbani Sector of Rajouri district in Jammu and Kashmir. "Pakistan this morning fired unprovoked on the LoC with mortar shelling and small-arms firing in Pallanwala, Jogwan and Keri areas targetting forward Indian positions," defense spokesman here said. He said that an Army Jawan deployed at a forward post in the area got martyred. 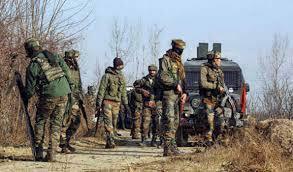 The Army retaliated the violation of the truce effectively and the exchange of fire lasted for some time. An Army jawan was also martyred in the same area in Pakistan forces firing on Tuesday morning. The martyred Jawan has been identified as Rifleman Yash Paul, 24, of Mantalai, Chenani, Udhampur.